Peeping around the side of the house towards the Laundry Garden there are many beautiful late spring surprises. Where did those luscious Lupins come from? And the ferns? Every year there are new clumps of this and that in my house gardens. The pots, of course, were chosen and positioned at the corner of the house to be - well - interesting. I'm growing a deep red Phormium in one and a weeping red Cordyline in the other. The ferns are all self-planted, and now grow right alongside the house path. 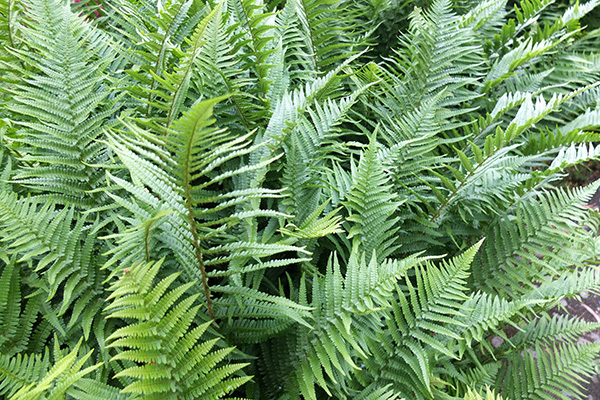 This is their best time - the fronds are freshly unfurled, and beautifully green. The Philadelphus shrub in the back of the picture is just coming into flower, and its fragrance is heavenly. Phyllis Bide on the rose archway is just starting to bloom, too. Late spring is a wonderfully colourful time in my garden - it's a very pretty time to take photographs. The harsh summer sunlight hasn't quite arrived, and everything that should be green is green. And nothing is too tired - not even the Head Gardener. Nice! 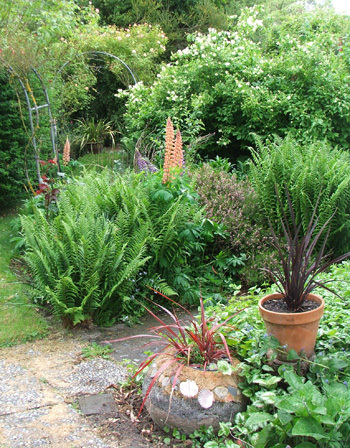 All the green ferns have planted themselves along the edges of the side house path and gardens. I'm so grateful!